We’ve all gotten used to making sure that our drinking water is filtered and safe. Bet you never thought that water in your shower deserved your closer attention too. Little do many of us know that toxins can enter our bodies during a shower just as much as when we drink water. This filter fits a handheld shower or a shower combo. It uses KDF filtering technique which works best for water with temperatures ranging from 36F(12C) to 113F (45C). The filtering technology used also helps balance the water’s pH level. It’s a great choice for its five-year warranty. Expect to replace cartridge every 6 to 9 months which are easy to find and re-order whether online or in stores. 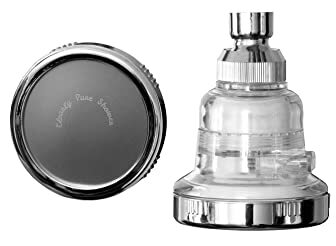 However, the biggest drawback is that it only uses a one-step filtering system whereas its competitors are already using at least two techniques to filter your tap. The other downside is that it is made of cheap plastic which can easily break. Consumers also report clogging of filter after just a few days of use. This product may be ideal for light or personal use but will not perform well for family use as it cannot take too much beating for easily getting damaged. 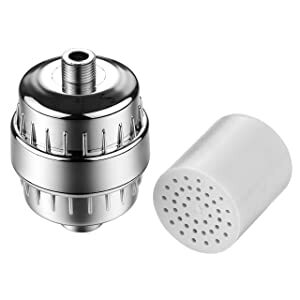 This shower filter is made with the Micro-Hole Technology system which uses a combination of calcium sulfite, carbon and magnetic wave technology to remove water impurities. Calcium sulfite has been shown to remove impurities by as much as 100 times more effective than either carbon or activated carbon filtering. You can buy this product with confidence given the 100 per cent, 60-day money back guarantee. This product allows you to enjoy a refreshing shower in three available settings: Rain, Massage (non pulsating), and combined. The downside is that the filtering process causes hot showers to become colder than the usual. Filter leaks have been reported by several consumers. This product will perform well for heavy use or use of the entire family. However, frequent heavy use may also mean that cartridge may be due for replacement earlier than the manufacturer’s estimate of 8 months. Uses a multi-stage filtration system that combines KDF, calcium sulfite and activated carbon filtering techniques that make the shower filter effective in either hot or cold water. This multi-stage process more effectively rids tap of chlorine and other impurities. The filtering system is activated depending on water temperatures with KDF working best for water at higher temperatures, activated carbon charcoal working best for lower water temperatures, and calcium sulfate capable of purifying both hot and cold water. Reviews show majority of buyers are satisfied with product performance. The only commonly reported drawback, based on a small percentage of users, is that filtering may cause water to lose pressure. 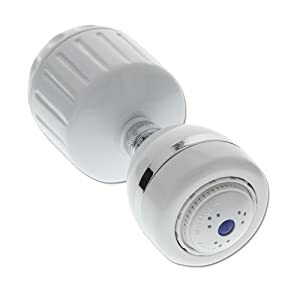 This product may also not fit all shower head types so you’d like to check that your unit is supported before buying. This product uses a comparatively more advanced, more intricate filtering process which assures you that you're getting a healthier shower. The aesthetic casing is also durable enough to withstand heavy use. This shower filter uses Sprite's trademark Chlorgon technology. 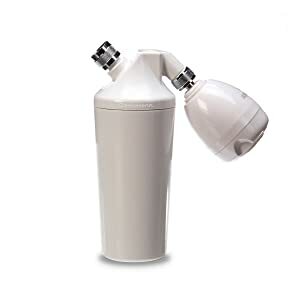 This filtering technique removes free chlorine, sodium hypochlorite, hydrogen sulfide, iron oxide, dirt, metals, sediments and odors from the shower water. It also gives a pH balanced water. Chlorgon is a filtering technology patented by the manufacturer which assures you that claims are backed up by scientific evidence. This product has earned the Gold Seal from the Water Quality Association’s Certification Program. The major drawbacks are that majority of buyers are dissatisfied with the poor quality of casing which has been reported several times to break in just a few weeks of use. It is therefore not ideal for frequent, heavy or family use. Filter also decreases water pressure. While the filtering system may be more advanced than most, this product is likely not a good buy for its short-lived lifespan. Also, filtering causing pipe leaks may cause your water home system to experience more harm that is not at all necessary to get your shower filtered. This product uses a dual-stage filtration technique that utilizes Aquasana’s patented AquaSorb HX natural coconut shell carbon filters that have been shown to effectively remove chlorine and other harmful chemicals from tap water. Stage two uses KDF technique to further filter out chlorine while also improving water pH balance. This product is made with a unique up flow design that will not reduce water pressure in the shower while filtering. 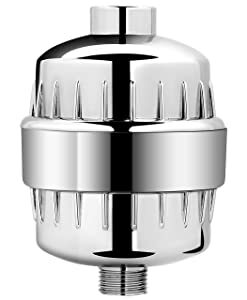 That’s because its unique design prevents clogging which is the most common complaint with competitor shower heads. The most disturbing buyer complaints are the ineffectiveness of the product to filter out impurities. Also, if you do not have regular access to an Aquasana distributor or outlet, you may want to rethink purchasing this product since the only replacement filters that will fit it are the ones sold by Aquasana. Before you can event start to worry about what shower head filter to get, you must first have a better understanding of why you need to get one installed in your shower in the first place. You’ll be surprised to know that these toilet fixtures are more than just merely necessary for aesthetics. In "The Possibilities Will Take Your Breath Away: Breath Analysis for Assessing Environmental Exposure" a study published in 2011 in the Journal of Environmental Science and Technology of the Americal Chemical Society. Both persons get exposure from trichloromethane in the air released by heated tap water. Experts say that hazardous materials can enter the body by mere skin contact. According to the US Agency for Toxic Substances and Disease Registry, trichloromethane can affect the body whether ingested, inhaled or by mere contact. At toxic levels, inhaling this chemical can cause instant dizziness, weakening of muscles and headache. Contact with the skin can cause sores. Long-term exposure, whether ingested, through inhalation or via skin contact can cause diseases associated with the liver, kidney and the central nervous system. Chloroform is a suspected carcinogen. Shower filter have become more of a must therefore as more evidence has become available about the potential health risks a shower can cause. These filters work by using activated carbon that strip off chlorine from your tap water. Unfortunately, when the water reaches a certain temperature, carbon filters lose their effectivity. This filtering technology utilizes the electromagnetic reaction that occurs when copper and zinc are put together. The reaction removes the unwanted metals and minerals from the tap water. The major downside is that KDF works well only when water is highly pressurized. This is one of the more recent filtering technologies, albeit many variations exist. Most of the time, manufacturers come up with their own patented technologies for this type of filtering techniques. For instance, Sprite Industries have come up with Chlorgon. It works on a two-stage filtering process that ensures the effectivity of the shower filter to work even at high water temperatures. WaterChef, on the other hand, has patented its ThermalGuard technology which uses catalytic carbon, which also works more efficiently at taking out chloroform from water than just the basic carbon filtering technique. Proponents explain that crystals in your shower help balance the positive and negative ions in the water and the surrounding air in the shower. In effect, the electricity created causes water to breakdown into smaller droplets that make it lighter while the lighter feel of surrounding air literally leaves a person with a better sense of well-being. These shower filters are literally filled with ascorbic acid which acts on the chlorinated water to neutralize it. These have been demonstrated to eliminate the most amount of chlorine and chloramines in water. However, these filters need to be replaced frequently and so can be costly. Your reasons for getting a shower filter installed in your bath can be manifold but, the primary reason you have for getting one must relate to your health. With clear evidence pointing to the hazards of showering with unfiltered tap water, you have to do whatever is possible to protect yourself and your family more than just desiring smoother skin and hair. In this regard, the AquaBliss High Output Universal Shower Filter with Replaceable Multi-Stage Filter Cartridge - Chrome is the clear runaway winner with us.